Dave and Debbie have reopened a chandlery in Newport at the head of the Medina River. Situated next to the Odessa Boatyard at Little London, where you will find all you need to keep your boat ship shape and Bristol fashion. T.S.Training is a professional RYA instructor training business, but also an RYA recognised school. RIB charter, wreck diving and power boat training. 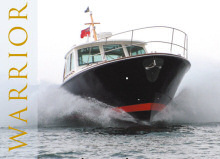 50 foot luxury motor yacht available for charter from Yarmouth, Isle of Wight. Sailing club situated at the North end of Shanklin Esplanade with most boats being Sprint 15 catamarans.